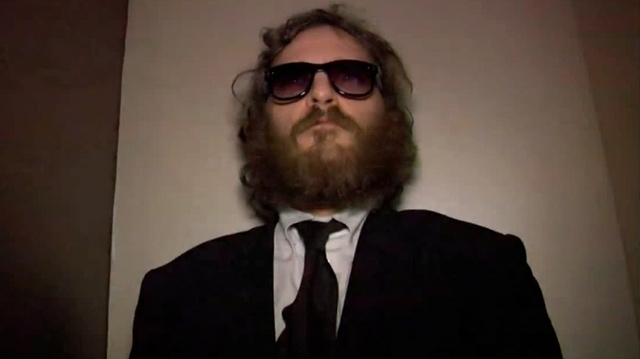 I’m Still Here, the already-infamous so-called documentary of a tumultuous year in the life of acclaimed actor Joaquin Phoenix (Gladiator), arrived on DVD and Blu-ray on Nov. 23, 2010, courtesy of Magnolia Home Entertainment for a suggested retail price of $26.98 and $29.98, respectively. Now that we all know the story in I’m Still Here (the independent film that was released in theaters in September 2010 to much hype) was manufactured by Phoenix and director Casey Affleck (actor in The Town), we can more accurately describe this mockumentary. The movie follows Phoenix as he announces his retirement from a successful film career in the fall of 2008 and sets off to reinvent himself as a hip hop musician, growing a long beard, donning a pair of too-cool shades and shaking up friends and fellow stars alike (including talk show host David Letterman) with his antic disposition. The sometimes funny, sometimes shocking and always engrossing film offers a strange, roundabout commentary on modern media and the concept of celebrity. Before the word was out that the movie and Phoenix’s year were previously plotted, I’m Still Here was promoted as a “portrait of an artist at a crossroads.” Hmmmm, that might still be the case.